Yes, cruises to South America are as exotic and tempting as they sound. The array of lush rainforests, roaring rivers, breath-taking vistas and Ancient Inca ruins offer something for every cruiser to enjoy, especially seniors. We’ve taken the guess work out of the equation and listed the top 5 cruises to South America for seniors. 1. Seniors qualify for discounted rates when booking Holland America’s ms Veendam. Interior staterooms are priced under $1300 per cruiser and some ports of call that this ship stops are in Uruguay, Chile, Glacier Alley and Argentina. Shore excursions to enjoy are half day sightseeing city and historical tours, visits to the religious statue—Christ the Redeemer, trekking through the Amazon to bird-watching and visiting the ancient ruins. 2. The Celebrity Infinity cruises to Argentina and Chile and makes our list for these cruises to South America countdown. During days at sea, the Infinity has senior-oriented options such as golf lesson simulators, cooking presentations and organized games and activities. Both Chile cruises and Argentina cruises will be unforgettable aboard the Celebrity Infinity. For $2,000/cruiser the Infinity will sail to several ports in Chile, through the Chilean Fjords and Straits of Magellan and into Uruguay and Buenos Aires, Argentina. 3. The Crystal Symphony, while not the least expensive on our list, it is well worth being near the top of our countdown. 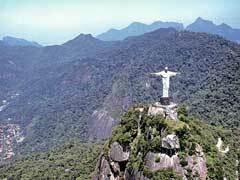 Cruises to Rio de Janeiro start off at $4,000/passenger but has programs in place for senior cruisers. Their average passenger demographic is aged 50-75 and they make efforts to accommodate for guests with special needs, such as wheel chair transfers and low fat or low calorie diet meal options. 4. The Celebrity Xpedition Galapagos Islands cruises for $3,500/person and are indeed a once in a lifetime dream for many retirees. Sitting far off the coast of Ecuador, passengers will board the vessel in Baltra and make stops to many of the major Galapagos Islands: Espanola, Floreana, Isabela and Santa Cruz. Low intensity nature tours geared for seniors are lead by naturalist guides and will put you in close proximity to wildlife sightings of animals and an assortment of fauna and flora only indigenous to the Galapagos region. 5. Carnival is perfect for the budget minded traveler and with repeat cruiser and AARP membership discounts available for guests over 55, South American destinations can be more affordable. The Splendor Fun Ship, embarking from Los Angeles will sail down the Mexican coastline making stops in Cabo San Lucas, then sailing into Guatemala before crossing the Equator. Then it will move towards Peru and Ecuador, and a final stop in Santiago, Chile all for under $1,000/person. On Carnival ships, if you are traveling along, you can request to be seated at dining table with other seniors traveling alone as well. Senior cruising on cruises to South America is an extraordinarily popular trend brought on by the ease of travel, discounted rates and activities geared toward this age group.